To save the eyes of any weary reader, this will be the last of my series on breakthroughs simply because after this event, there were no breakthroughs, only realizations. 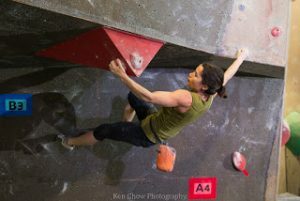 For now, I’ll tell you a little story about the competition which took place at the end of January, the BC Provincials. Headed into the crowded zone of qualifiers, my goal was to bring the state of mind needed to do my best: that of relaxation and focus. For the past few years of my competition journey, I knew this was necessary but wasn’t sure of the how, let alone my capability. But in the qualifying round of the competition a week prior, I was surprised to find this state deep within. There was however, a glitch.... For the past couple weeks my right shoulder had been complaining and was to the point where simple things like flushing the toilet hurt. When I picked up my bag for qualifiers, a sharp pain was sent through the sensitive joint and the feeling of creakiness and unease took over. I wondered what the hell was I doing entering a competition given its state. The thought of withdrawing became more real. While the officials gave me permission to pull out, I first wanted to warm up and then decide. Surprisingly, the pain gradually subsided, so stubbornly I kept going. Later, I learned that with tendonitis, once the joint gets moving, the inflammation flushes itself out, leading to the misunderstanding that things are better. Well, regardless, I was psyched! My body was allowing me one more go! Amazingly, my head space for qualifiers was great, much better than my standard. The desired neural pathways were becoming more engrained and for the most part, my breath was relaxed, my eyes focused. When I fell, I stayed calm and practical; focusing on the physicality, such as a different beta or throwing with more commitment. I guarded my shoulder a little but overall was psyched to have made it to finals without more damage. At this time, I returned to iso having topped all of the problems so far. Until then, I hadn’t thought much of the results. I figured everyone would send this problem since I had done it meaning the results would come down to the last. 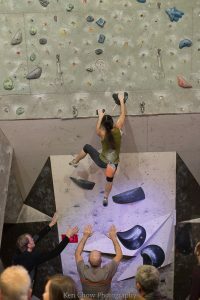 But finally, as each competitor returned, their chatter revealed that only two others had topped, meaning, if I did the last problem, I would have easily podiumed. Thinking of the outcome was of course, a mistake. Allowing other competitors to talk to me was also a mistake. The nervousness and pressure came back with vengeance. Feeling my desired focus and mindset quickly disappearing, I isolated myself in order to recuperate. 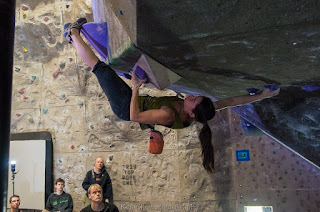 As I stood waiting for the final problem, my body was jittery; clearly ignoring my instructions to relax and focus. My eyes start working in a darting fashion, taking in various things but nothing in particular. 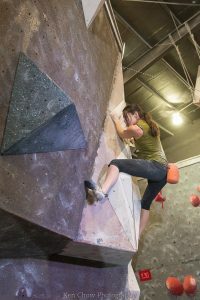 The problem was littered in volumes meaning the type of climbing is very body position intensive; one has to be relaxed in order to feel the moves. Normally I am quite good at this style but as I ordered my mind to calm down, I simultaneously over gripped the start holds. Missing feet options and using zero technique, the pump quickly filled my forearms. With a scattered breath, I proceeded to blow any chance of podium. Upon timing out, I sat frustrated with my lost focus and watched the others climb it with the calmness and confidence from years of competition experience. When the comp finished, I put my shoes back on and sent the problem. I realized that on all my falls, relaxing more may have helped open my eyes to the various betas such as required bat hangs. 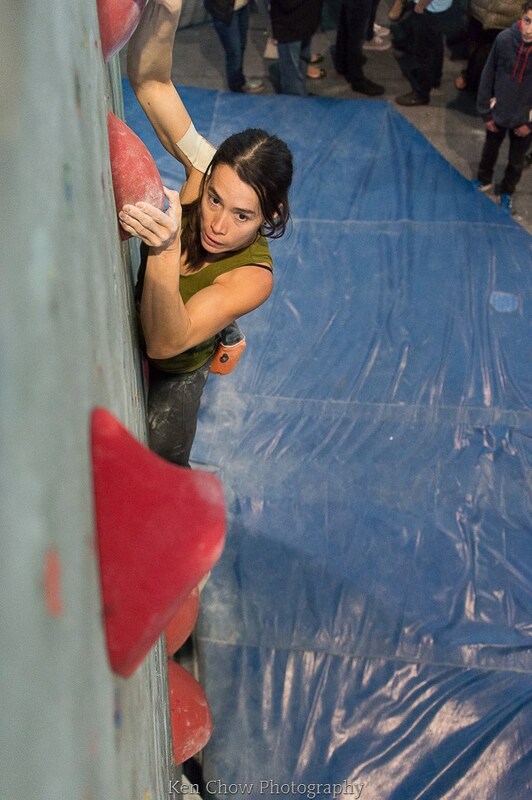 Annoyed with having lost my focus, I was still somewhat content for having held it together through qualifiers and 3 of the 4 final problems. I wanted to embed this’ keeping it together feeling’ but it battled with a loud voice that put me down for having blown it at the end. Tonde once said to me, ‘competitions are a huge mental game of choosing the right voice to listen to’. It’s a battle between good and evil, lightness verses dark. Either way, it wasn’t easy to leave content; I’m hard on myself for not keeping it together despite the progress. But perhaps that’s the real battle… finding balance between self-criticism and acceptance for making mistakes no matter what; in other words, being kind to oneself in moments of loathing. Thanks for reading and thanks to Ken Chow for the many photos! Like what you read? Show your appreciation here!